So here's the setting for this story: I come into work the day after a company barbecue. One of our employees decided to do a whole hog barbecue for the outing, which by all accounts was a resounding success although I was not present to sample the bounty. I open up my mini fridge behind my desk to put my lunch in for the day, and see a large foil package in there that is obviously out of place. I remember being offered part of a pork belly from this whole hog so I assume that is where this large package came from, although the package is much bigger than a portion of pork belly. 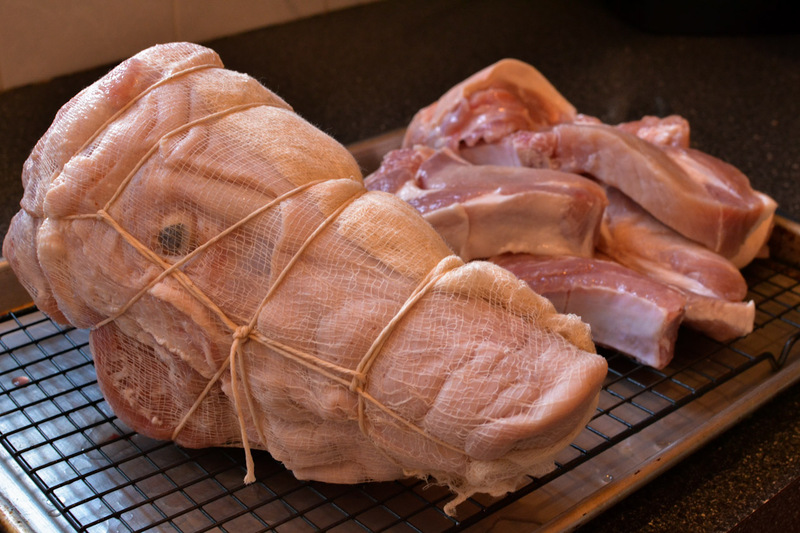 I decide to open it up, and lo and behold a pig's head is neatly packed in the layers of foil. I came to find out later that another coworker had requested it but was only really interested in acquiring the skull. 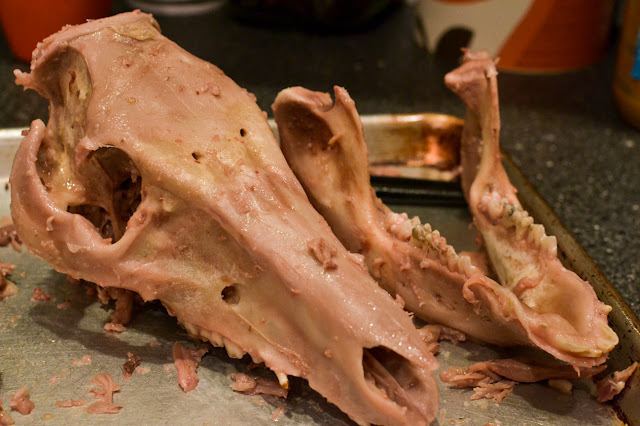 I saw an opportunity to do something fun and learn something new, in addition to taking what might otherwise have been waste and turn it into something better, so I offered to do something with the pig's head and just return the skull in a cleaned state, which worked out for all parties involved. A handshake later and I was the temporary owner of a pig's head. So now I faced this question: what do you do when you have a pig's head and no idea what to do with it? The answer, for me, was pretty simple - it's time to learn how to make terrines. I had to go to my chef extraordinaire friend, Mike, who gave me a great recipe and was willing to let me share it. It's time consuming - at least a couple days worth of work, but I was able to do it over a couple of weeknights after work. After it was all said and done, I brought the head in to work for everyone to try, and it received pretty raving reviews, even from the non-adventurous eaters who knew damn well what they were about to try. This is hard to provide a clear cut recipe on. I ended up with what I felt was a smaller head, so I picked up some country style ribs to add to the recipe to make sure I didn't end up with less meat than expected. If you can, make sure that you get a head including the jowls, as they contain a significant amount of meat (they are also delicious). 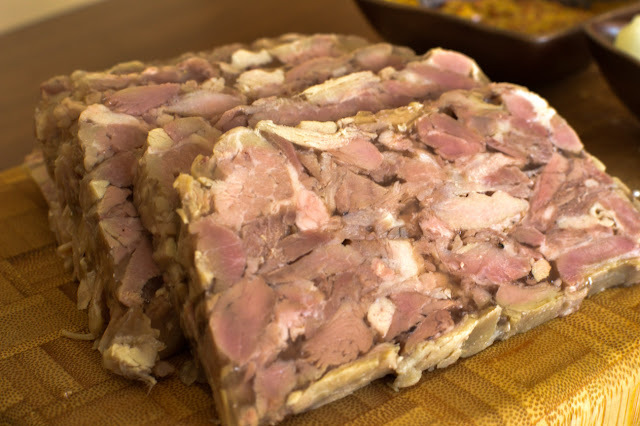 You will see in my photos that the jowls had been removed but I did have them separately, so they did make it into the terrine. The amount of water you use is really dependent on the size of the head. The salt to water ratio is .5 c per gallon of water. One method to figure out how much water to use is add measured amounts of water to a pot (so that you can keep track of how much salt you need to add). Check whether the head is fully covered by the water or not, if not, continue adding measured amounts of water (I used a standard 2 cup measuring cup to add water. For quick reference, there are 4 cups in a quart, and 4 quarts in a gallon. That makes 16 cups in 1 gallon). When you have the head fully covered, remove it from the liquid. Start by heating up the water and adding all of the ingredients. Feel free to add or remove ingredients based on what is available - the only required ingredient is the salt. 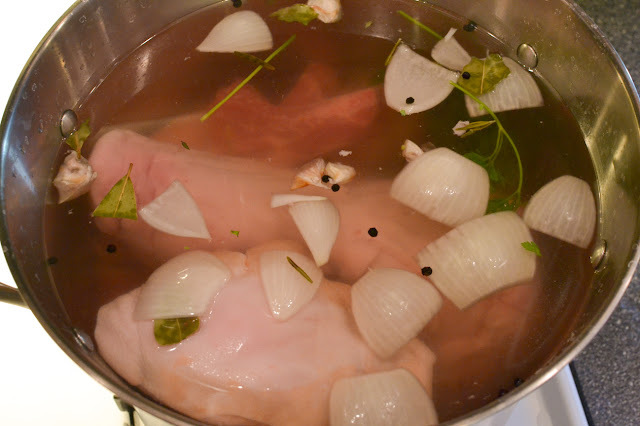 Bring the brine just to a boil and turn off the heat, allowing it to cool and the ingredients to steep. When the brine is cool, add the head and let it sit in the brine overnight - 16 to 24 hours in total. 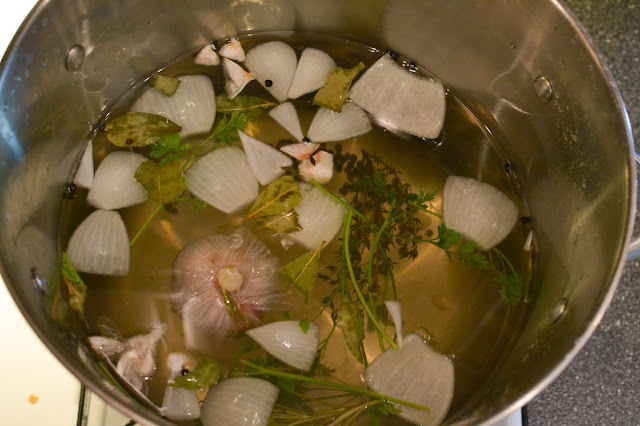 The plan here is to fortify stock with some flavors, which will then become our cooking liquid for the head. 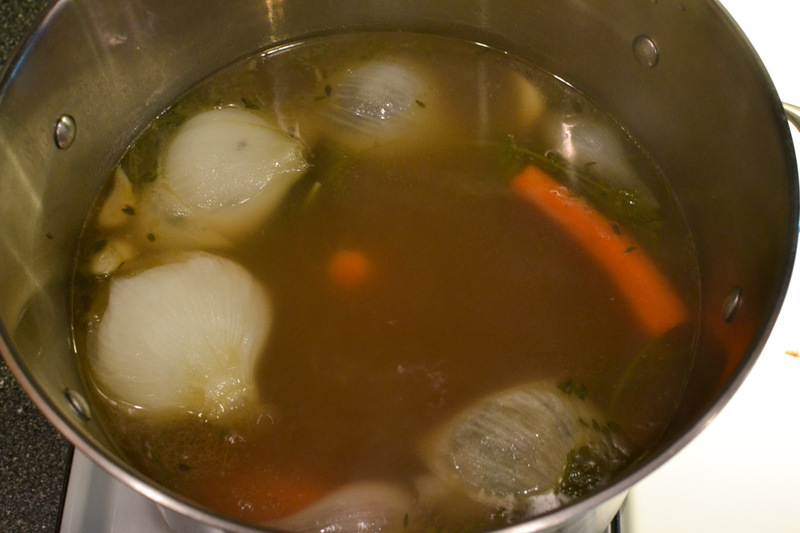 I used the same ingredients that used in the brine, and I used a mix of homemade stock and store-bought stock (confession: I don't often have 2ish gallons of homemade stock on-hand and ready to go). In my mind, fortifying the stock in addition to the fact that the head will add so much flavor and body to the stock means you should feel no shame about using store bought stock here, just use a standard reliable stock (365, Pacific, and begrudgingly, Rachel Ray brands all come to mind for me). Just don't use boullion paste, it's way too salty. If you want make your life easier, wrap the ingredients in the cheesecloth and make a little bouquet garni. Drop that into the stock and bring to a boil. Keep the ingredients at a simmer while you prepare the head for cooking. You can see in this photo that I opted not to make my life easier, but somehow I was able to summon the strength to make it all work. Remove the head from the brine and pat it dry. Discard the brine. Allow the head to sit on a hotel pan or something that can catch liquid, it will continue to drip for a little while after being removed from the brine. Another tip to make your life easier: wrap the head in cheesecloth and tie it down with butcher's twine. This will keep everything together, especially late in cooking when the connective tissue has broken down. 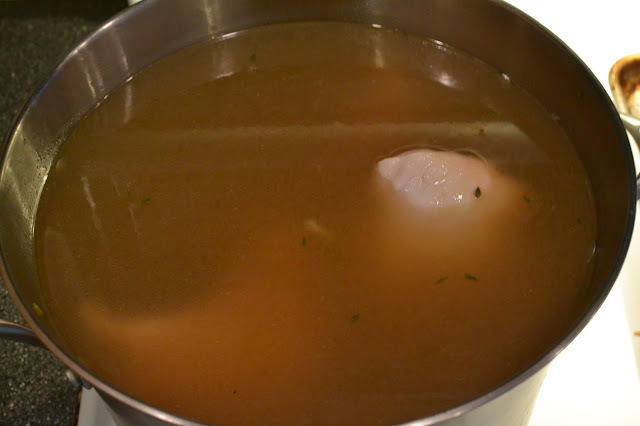 Bring your stock to a simmer and add the head. Simmer the head for 2 to 2½ hours, or until the meat pulls away very easily from the head. Something interesting to note while this is happening - take notice of the viscosity of the liquid before you begin braising and how much it thickens over the course of cooking. I swear that by the time the head was fully cooked, my stock looked like it was the thickness of canola oil or something. I realize that is a gross comparison, but it was crazy to watch the gelatin be released from the head and thicken the stock. Remove the head from the stock and allow to cool. You shouldn't need all of the stock for this - I used approximately a quart of stock and reduced it in a separate saucepan. Add a couple of sheets of gelatin, or a packet of powdered gelatin if you are using that. Reduce the stock by half, then season to taste with vinegar, just to brighten it up and cut through the richness a little bit. Reserve the rest of the stock and freeze it, it's probably the best stock you will ever have on hand so save it for something special. Like maybe ramen. Use your fingers to remove every piece of flesh from the skull. This was a real test of my meddle. It's easy to wax philosophical about 'nose to tail' cooking and believe in whole animal cookery, but until you have picked through an entire pig's head with your bare fingers, you can't really have a grasp of what that entails. I'll leave out the gory details here but be ready for a couple deep breath moments. Try to pick through and separate the meat from the large chunks of fat, glands, and other connective tissue. I discarded most of those things and kept just the meat. Try to keep it in nice sized chunks, you don't want it to be shredded or minced, it should keep some form and texture. Put the meat in a mixing bowl and season to taste with white wine vinegar, salt and pepper. If you are lucky enough to own a terrine mold, this is where you would want to break it out. 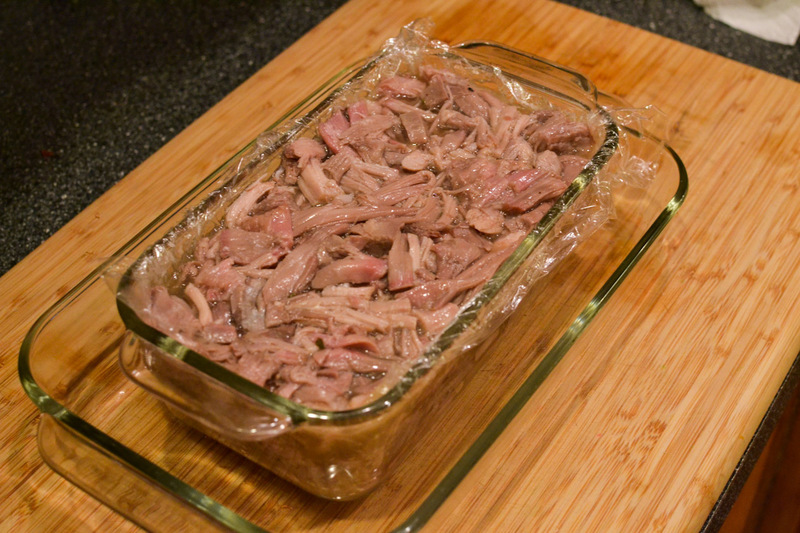 If not, choose a container that will hold the meat (I used a Pyrex bread pan). You will also need a flat press-like object shaped roughly the same as the pan that you will use to compress the terrine. I sacrificed a takeout tupperware lid to get something roughly the correct size. Line the pan with plastic wrap on all sides, and place it inside of another container that will catch any runoff liquid from the terrine. 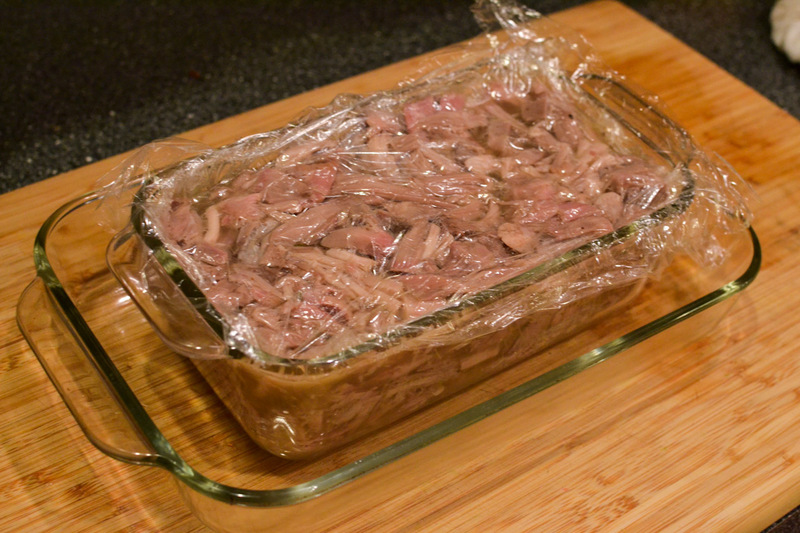 The plastic wrap lining will make removal much easier after the terrine has been chilled. 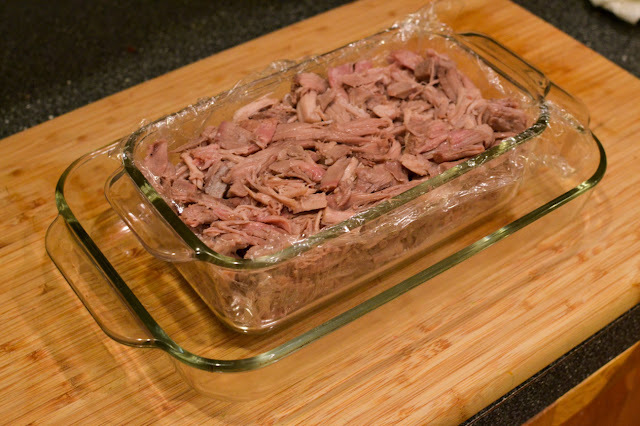 Layer the meat in the dish and apply some pressure to try to compress it slightly. Pour over the reduced stock until the terrine pan is filled to the top, cover with plastic wrap, then allow the entire thing to cool for 30 minutes. 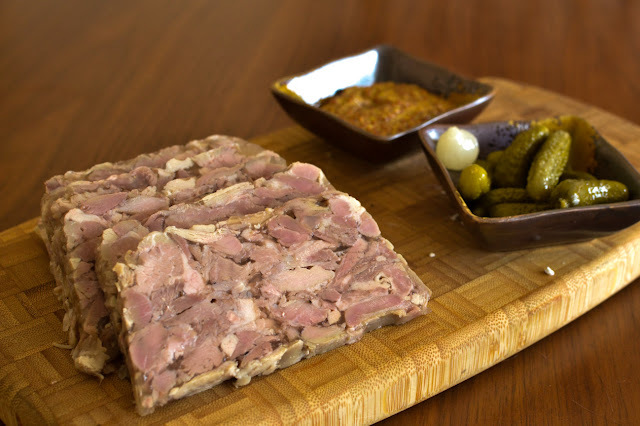 Lay your lid on top of the terrine and add a heavy weight to it - try to evenly distribute the weight as much as possible. 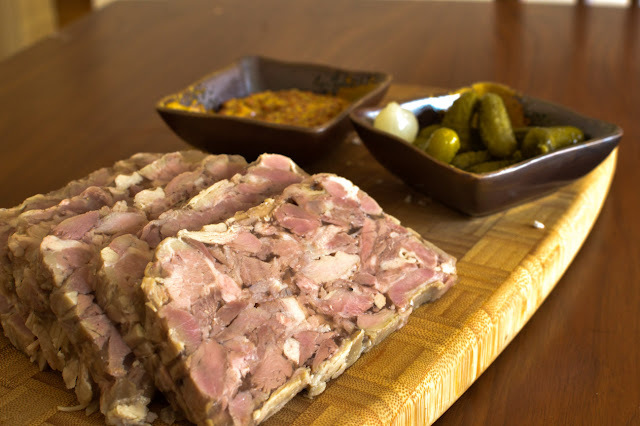 Place the terrine in the refrigerator overnight. When ready to serve, flip the container upside down and use the plastic wrap to help remove the terrine from the mold. Remove all plastic wrap, slice pretty thinly with your sharpest knife, and allow to come to room temperature before serving. Serve with pretty much anything - but here are some ideas: cornichons, bread, crackers, mustard, aioili, olives, anything else pickled, beer, wine, cider, basically everything. 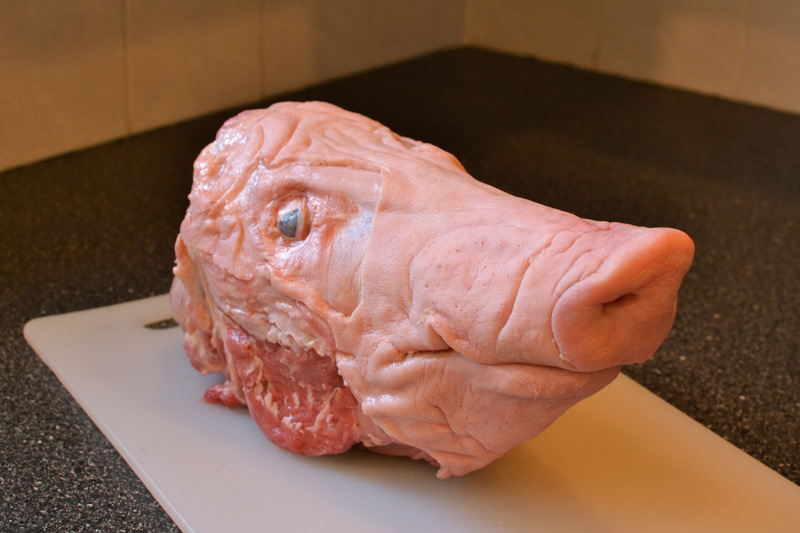 Although the head seemed super intimidating at first, it ended up being a fun unexpected weeknight experiment that taught me a lot about this whole 'nose to tail' business. It also turned out great, which certainly helps. If you find yourself with the opportunity to try something like this, I highly suggest that you go for it! It's not that hard, although time consuming, and you will definitely learn a lot.